A few photos from our recent family trip to Ireland. 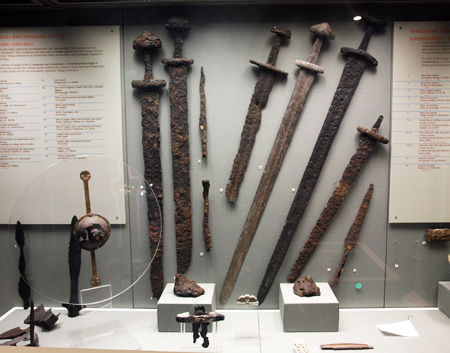 This first one is a display of Viking-era swords at the national history/archaeological museum in Dublin. One of the things that made Ireland so amazing for me was the sense of age and history in everything, especially compared to Nebraska, where something 100 years old is considered antique. 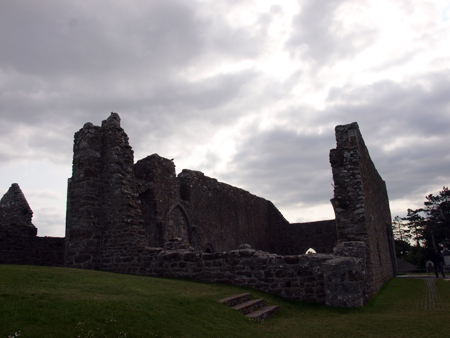 Next is a picture of some of the ruins at the Clonmacnoise Monastary. This site was founded a little after 500 A.D. It is still used at the present as a burial ground (we noticed recent tombstones) and a modern church sits in a discreet location on the site for annual services. 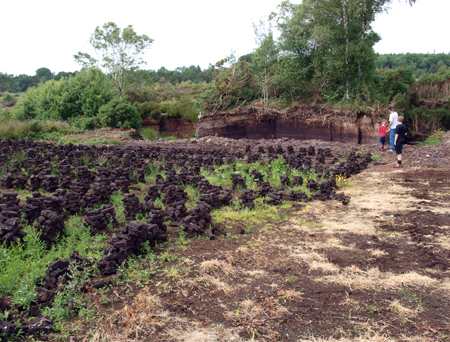 Friendly people, beautiful scenery, and a sense of place and history were very evident the whole time we were in Ireland. If you ever get a chance to go there, I highly recommend it. Oh,what a great trip for all of you! It is nice to read of your adventure. We have not been to Ireland but we have visited Scotland,Germany and France. Scotland is most definitely on the list for a return visit and Ireland is something we have talked about. It sounds like your spring/Summer has gone well. Summer has been very nice here. Alas, it passes quickly. Hi Lakes! Good to hear from you. Summer has been going fast. I would love to visit some of those countries you saw. I have some Scottish ancestry as well as German. Of course, France is a must-see at some point on the bucket list. Alas, so many destinations and so little money…. Scots/English on my Fathers side. Swedish on my Mothers. Straight Norwegian on Debbie’s side. We loved Scotland. The cities as well as the countryside. Amazing views. Incredible history. Wonderful hospitality.Such nice people. We highly recommend it. Now I totally have to go! Will consult you for great ideas for sights when we get our $ saved….